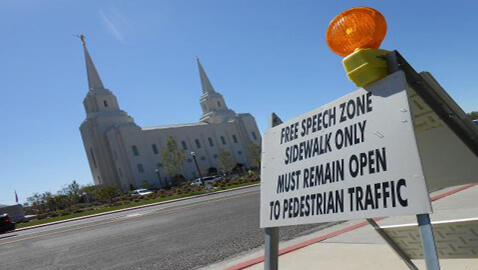 Home » Legal News » Are Brigham City’s “Free Speech Zones” a Strategy to Stifle Free Speech? Are Brigham City’s “Free Speech Zones” a Strategy to Stifle Free Speech? You thought “free speech” was protected under the Constitution and a right of every U.S. Citizen, right? Apparently, the municipal authorities in Brigham, Utah, a predominantly Mormon town of about 18,000 people, do not agree. On Tuesday, on behalf of the Main Street Church, the ACLU filed a lawsuit against Brigham City over its “free speech zone” ordinance that requires a municipal permit and licensed establishment of “free speech zones” to engage in free speech. The Main Street Church, a non-denominational faith, was barred under the municipal statute from distributing pamphlets on some sidewalks near a new Mormon temple in the town. Apparently, the ordinance requires that any individual or group that wishes to stage a demonstration or hand out literature, or address the public directly on any issue, must seek municipal license for a “free speech zone” to engage in free speech. Such “free speech zones,” if allowed, usually include limits on the time, place, and number of participants. Infringing the ordinance carries a misdemeanor criminal prosecution with up to 90 days in jail upon guilty findings. Civil fines range to $750 for each infringement and attempt to engage in unlicensed free speech within the jurisdiction of the municipal authorities.